August 16, 2011 - Australia’s Tiger Airways was suspended from flying by the Civil Aviation Safety Authority back in July due to various safety concerns. The grounding coincided with school holidays in New South Wales and Victoria. News agencies estimated that 35,000 people may have been affected. It is estimated that Tiger will lose AU$4.2 million for every week of suspension. Safety concerns included; on February 11, erroneous data was suspected to have been put into a flight computer. On March3, a traffic collision avoidance system alarm was triggered after a Tiger Airlines plane flew too close to a smaller aircraft. Following this, Tiger was issued with a "show-cause" notice for pilot training and maintenance. Spokeswoman Vanessa Regan told news media that "There is no cause for concern. CASA has taken no action. We continue to operate and we want to reassure our customers that there is no risk to safety and we continue as normal". On April 20, another Tiger aircraft flew below the published minimum altitude near Melbourne Airport. On June 7, another Tiger aircraft again descended below the minimum altitude near Avalon Airport. 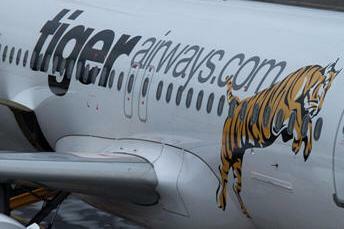 On July 1, a further Tiger A320 from Brisbane to Melbourne flew too close to a Boeing 767. Special conditions were imposed on its Air Operator Certificate giving Tiger 60 days from mid June to complete instrument rating renewals. This direction was extended to all of its pilots. A spokesperson for CASA, Peter Gibson, told the media that "Tiger has not been able to, at this stage, convince us that they can continue operations safely, so that's why they're on the ground". Citing a view that future problems would also occur, he also commented that "We [CASA] believe this is symptomatic of problems within the airline [and] we've put them on the ground while we consider all these issues". Tiger stated that it was co-operating fully with CASA. On July 6, CASA announced that it would lodge a request for extension to the suspension until August 1, at the Federal Court in Melbourne, while CASA continued to investigate, after the investigation raised more questions into Tiger Airways Australia, and until CASA was satisfied that the airline "no longer poses a serious and imminent risk to air safety". Consumer regulators, such as the Australian Competition and Consumer Commission (ACCC), warned Tiger Airways Australia that the airline needed to inform customers who purchased tickets about the uncertainty as to whether the airline would by flying from 9 July. Tiger Airways Australia suspended its ticket sales on July 5, however the ACCC's chairman, Graeme Samuel, stated that Tiger Airways Australia's "lack of response until that point was far from satisfactory". After five weeks CASA lifted the ban and Tiger recommenced operations on August 12, but only for 18 flights a day between Melbourne and Sydney. Tiger announced it was suspending operations from Avalon Airport and would close its Adelaide base altogether in a "commercially motivated" decision. It also said that it would reduce its fleet to eight aircraft. Ground workers at Australia’s airports want CASA and other government agencies to put in place improvements in safety and security for baggage handlers and other employees and contractors as Tiger Airways announces its return to the skies. TWU national secretary, Tony Sheldon, said Tiger Airway’s corporate structure was based on the lowest standards, including employment conditions, and said the grounding of the airline also drove the weekly pay packet of many employees “into the dirt”, and saw many people working for Tiger not paid while the airline was grounded. “Tiger outsources its ground handling work, as well as its safety and security responsibilities, to a company which has employed its workforce largely on a casual basis with little training, job security, and quite frankly, under some of the worst conditions in the industry. Other airlines, including Qantas/Jetstar also used this company for outsourced labor, even though they control 65 per cent of the market,” Mr Sheldon said. “CASA has shown in the past it is a reluctant regulator. It has had years to investigate claims made not just against Tiger, but other airlines including Qantas/Jetsar, and has failed to adequately protect the travelling public. Because Tiger’s safety problems are at the front of the plane for all to see, CASA has acted. But this is little more than throwing a clean blanket over a dog’s bed – although you can’t see it, the smell of a wet dog remains. “We have employees at Sydney International terminal who have not had a fire drill in 17 years of employment. We have airlines and their contractors using 40,000 visitor passes at one airport gate each year - that is 800 times a week the secure part of the airport is accessed by unscreened staff who have not had the required ASIO or Police checks. CASA needs to investigate all claims properly in regards to airport safety and security. Until then, the Australian travelling public and the aviation workforce will only be travelling under the illusion of safety,” Mr Sheldon said. The Daily Telegraph reported in July that “230 casual workers for Tiger are not receiving any income as the budget airway’s suspension enters week four. While Tiger employs 250 permanent staff in Melbourne who are still being paid, 300 counter ticketing and ramp staff are outsourced to labor firm Aero-care, while 130 casual cabin crew were also outsourced. Aero-care chief executive Glenn Rutherford, said about 100 staff had been redeployed to other carriers while another 100 had taken forced annual leave and the rest were not being paid."